Truman's Aunt Fran sends him an aunt farm for his birthday. Hundreds of aunts appear at Truman's house. He cares for them until he runs out of room. Truman puts a sign in his yard which says that the aunts are free to good homes. Girls and boys line up at Truman's house and each take an aunt home. 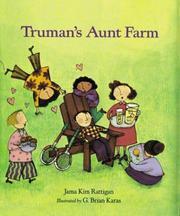 Rattigan, Jama Kim, “Truman's aunt farm,” Children's Picture Book Database at Miami University, accessed April 24, 2019, https://dlp.lib.miamioh.edu/picturebook/items/show/9059.